The rate of inflation is pretty low these days. That’s because even though the cost of things you need to survive—energy, food, housing, health care—is soaring, a lot of prices for durable (and not so durable) consumer goods have been declining, thanks to cheap labor in developing nations and the efficiency of global supply and transportation networks. You can buy a billboard-sized T.V. at Costco for $1000—or a leather motorcycle jacket for $399. The price of that jacket is much lower than the $600 I forked over for a hand-made in USA Vanson jacket almost 20 years ago, but so is the quality. I’d have no fear of sliding the length of a football field wrapped in the seemingly phone book-thick hide of that Vanson, but in the ill-fitting, cheaply-made, poorly-stitched simulacra of protective apparel that’s hanging in many motorcycle shops these days? No thanks — in addition to thinner material, these jackets usually lack the specialized seam-stitching techniques that add durability (and expense) to motorcycle apparel. They are frequently short a back protector as well, usually substituting a cheap-o bit of back-protector-shaped foam rubber in the appropriate pocket. And it’s not just protection that’s lacking—it’s also features and fit. Cheap jackets are usually fashionably styled … and that means a baggy, sloppy fit that makes you look like an inmate of some kind (some people actually like that look these days – ed.) and lets in drafts. That’s why I was skeptical when my favorite parts manager handed me a Weise (say “vise”) Leathers Thruxton jacket. “Dude — you gotta try this!” The price tag seemed suspiciously low at just $415.99, but I shrugged and let him help me slip it on. Some garments just feel right the moment you put them on, and the Weise was one of those. The 1.2mm distressed leather is butter soft, so no break-in required, but the fit was just right for me, and it felt like I had been wearing it forever, thanks in part to the underarm stretch panels. The armor was present, but didn’t hamper movement, and the shoulders and waist seemed tailored for my frame. My only complaints about fit are the teeny Euro-style backwards main zipper, which requires a lot of practice to get used to, the neck snap — it’s too tight — and the back protector (yes, it comes with a CE-standard back protector as well as CE armor in the elbows and shoulders) was larger and less flexible than I like. Oh, and it’s also lacking a zipper to attach riding pants. Those few nits aside, this is a comfortable, stylish and practical jacket. 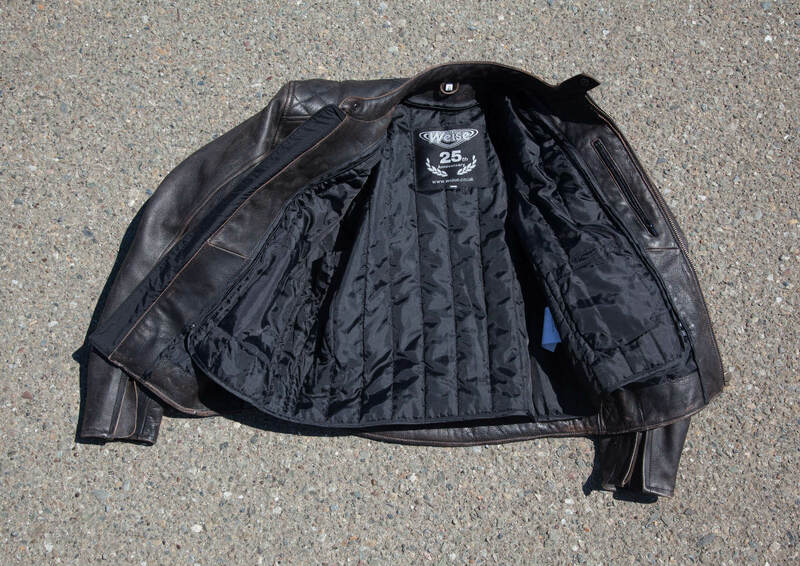 I got the jacket so I could be outfitted for a 200-mile press ride on a new scooter model, and it was a great choice, comfortable in a 30-degree temperature range thanks to the chest-pocket zippers and removable thermal liner. It seals against wind very well, even with the top snap open, and the cuff zips allow even more airflow. It should also look good with a variety of bikes—scooters, vintage machines, cruisers or even aggressive streetfighters, and the cut is conservative enough to make the Thruxton a stylish out-for-the evening jacket (the armor is easily removable to accommodate that). Luckily, I didn’t get to test the protective qualities of the Thruxton, but the stitching and quality of the armor make me confident it will be plenty protective at the speeds where most street crashes occur, even if it likely won’t hold up to as many crashes as something made with heavier, stiffer and thicker competition-grade hide. But then it wouldn’t be as comfortable, and you wouldn’t wear it as much, and if gear is hanging in your closet while you’re crashing, it won’t do you much good at all, will it? My P&A guy also had me try on a pair of Weise’s Victory gloves ($69), and it was the same love-at-first-fitting experience as the Thruxton. 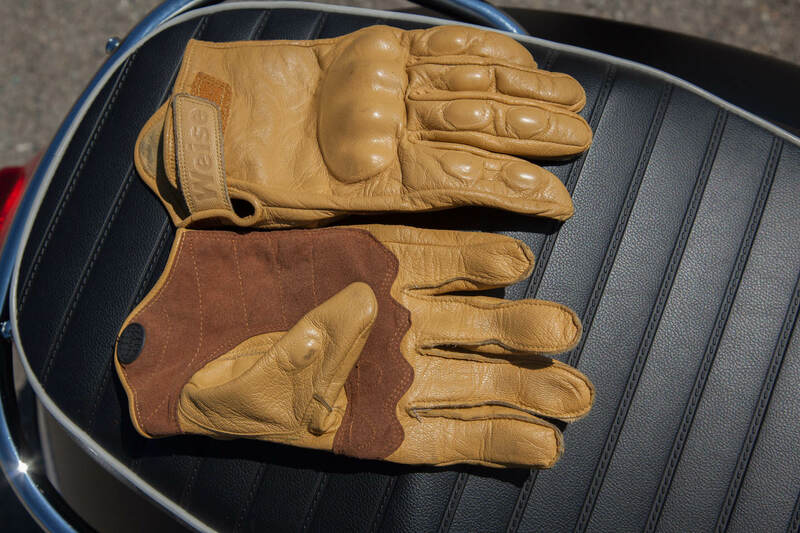 These gloves are made from soft goatskin and like the Thruxton jacket, need no break-in. They’re comfortable, but also fully featured, like memory-foam armored knuckles, an adjustable wrist strap, little rubber grab pads to assist putting the gloves on, and a Chamude (a soft synthetic suede-like material) panel on the palm for better protection and grip. The Victory gloves are comfortable and look great with a jacket like the Thruxton, but I could say that about a lot of gloves. I like my pair because, like the jacket, they just seem to fit my hands better than other gloves—not so tight they pinch, and not so loose they bunch up in an irritating fashion. I also appreciated the external seams on the fingers, which helps for long-term comfort. I wasn’t able to crash-test them (luckily! ), but I imagine, like the jacket, they would hold up well at the speeds most street crashes happen. The leather is thin, keeping them cool and comfortable even in the low 100-degree range, but goat hide is tougher than cow leather and the extra layer of Chamude should help. I am critical of the placement of the main seam right by the thumb, but it’s double-stitched and protected by the Chamude and shouldn’t blow apart on impact as I’ve seen many cheap gloves do. I’m very impressed by the design, fit and comfort of Weise’s products, especially given the reasonable prices. Hooray for the New Normal! Weise’s Thruxton jacket comes in U.S. sizes 40-50 and has a $415.99 retail price. The Victory gloves are sized XS to 4XL and are $69. SF Moto in San Francisco, CA loaned me the Weise gear to try out, but you can go to www.fowlersdistribution.com for more information on the product line. I wish I could say that I’m ATGATT, but I’m not. Helmets are required in NY and I would wear one anyway (bicycling and skiing as well), but my wife and I both have beautiful Fox Creek jackets that sadly stay on the hangers in the closet when the temp pushes past 80.
where do i get one of those city bike shirts? They’re not crash-proof! Don’t wear one! Good gear is important, but it is also important to use All the Gear, a great jacket with a pair of cotton jeans………. ridicules. Dress for the crash not the ride. ALL THE GEAR, ALL THE TIME. Get the best gear you can afford. The Icon Holligan jeans are cotton jeans, yes. But also cotton jeans with kevlar panels in the knees, with zippered pockets for CE-approved armor. 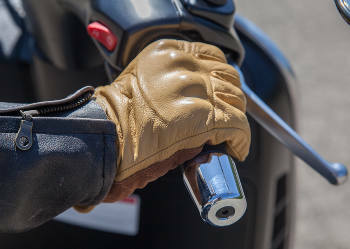 I felt a little silly whilst putting on ATGATT last fall, as winter was descending on the NE, when I was just taking my bike down to the corner gas station to fill up and add Sta-bil for the long winter months. BUT… When I low sided coming out of the driveway on the cold pavement on cold tires. I was convinced of the value of “ATGATT”. Nice jacket and gloves. I like to look pretty when I fall. It’s not unheard of for gloves to be thrown/torn from the wearer’s hands in a crash. For that reason it’s important to size a glove so that it fits snugly around the wrist to hopefully prevent that from happening. A well fitting glove can truly help a good ride a great one! How many people ride with no hand protection? Only the ones that aren’t planning on going down. These look like really nice gloves. I plan on not going down every time I ride. They do look like nice gloves though, but they look hot. Perforations would be nice. My point exactly. I’ve never planned that, but it’s happened and the first thing I’ve done is put my hands out to break the fall. ATGATT.